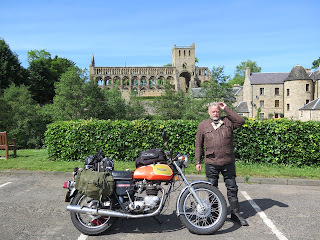 This blog will catalogue my motoring history, for no better reason than motorcycling was the reason I do what I do. ...and had nutrition free breakfasts and returned to collect the bikes from the NCP. The Bonneville had been a little incontinent in the oil department, though nothing excessive, while the Kawasaki had managed to burn its way through a quantity of semi-synthetic, so I donated a half a litre of Castrol GP I’d picked up at an autojumble, and we set off and immediately got lost. We had intended to grit our teeth and belt up the M6 to Preston, but a check of the map suggested an alternative. Why not go through the Mersey tunnel and skirt the coast, head up to Southport and rejoin the A6 further north? The first part of this brilliant plan went well. When we got out of the tunnel at the other side we found ourselves being directed by friendly waving policemen, who had obviously been told of our arrival, and ended up at Liverpool docks, having been mistaken for being sports bike fans on the way to the Isle of Man TT. Extricating ourselves from the city through Liverpool’s old docklands was interesting – I have a thing for derelict industrial wastelands, and this was just that. Onwards we rode through Mersey's fat suburbs and it suddenly all went to heck. For some reason, that part of the country is infested with aggressive and stupid Audi drivers, possibly overpaid football stars or something, all of whom seemed to be intent on running one off the road at every opportunity. It also seems to have a set of traffic lights every three hundred yards, all of them at red. All of which was a bit of a bind for a Triumph Bonneville with a stiff clutch and a Kawasaki that belched black smoke at every acceleration point. The dreadfully dull Crosby and Formby, their gyms, tanning parlours and takeaways passed by in a tiresome, unattractive and clunky hack, and a trip to the beach where Antony Gormley’s cast iron sculptures gaze out to sea had to be aborted because there was a 30 car one-hour queue to get into the car park, and a ridiculous National Trust parking charge too. So we headed for Southport. I’d been to Southport as a very small child and had fond memories of it, and my Dad had told me magical tales of being evacuated there during WW2 so this looked promising. First of all, we took a wrong turning and ended up on a bleak beach, girded by a Pontins holiday camp that had barbed wire on the walls. Whether to keep people out or keep them in was moot point. There was a derelict hotel too, which looked as if it was something from League of Gentlemen, and this added to its charm. After we blatted up and down the esplanade for a bit and passed a nightmarish Fun Park made to look like an Arab fort which looked as if it had been attacked by a drone strike we made it into Southport for lunch, at our second Wetherspoons. Southport, we felt, was doing its best, but had some truly ugly features. A couple of psychotic motorists in Range Rovers attempted to kill us by driving stupidly – surely not everyone round there plays for Everton or Liverpool? Or is a coke dealer? Anticipating a clearer run from there on we headed on, and found Preston to be almost as ghastly as Crosby, but we chugged our way through it and made Lancaster just in time for another gridlocked rush hour. We fought our way through, stopping afterwards at an actual proper truckstop near Carnforth, and took a look at the map. Our destination in Westmorland wasn’t that far away, and we decided that having endured a series of horrid runs, we’d try and have some fun, so decided to go into the Lake District, head over the Kirkstone Pass, down past Ullswater and on to our destination on the other side of Penrith. There was a light drizzle as we left the truckstop, but we felt this was sure to change, and sure enough it did, becoming a torrential downpour as we made it into Windermere and we began to climb the Kirkstone Pass. The rain got even heavier until we found cloudbase and not only could we now not see where we were going, but were still soaked, while passing signs indicating that half the accidents on the Pass involved motorcycles. We kept climbing with about 15 yards of vision before getting caught behind a lorry carrying flammable gas. So far, so Treasure of the Sierra Madre. The lorry chugged along at 20, stopping occasionally for hairpins and eventually pulled over. To be honest the road was so treacherous I hadn’t minded going so slowly, and the subsequent steep drop over the pass to Ullswater put a strain on the Bonneville’s single disc. I’d gone onto reserve as we made it down to lake level but reckoned that with just 10 miles to go to Penrith, all would be well. It wasn’t and I rolled silently to a halt in the middle of nowhere. We checked phones and miraculously we found that not only was there a signal, but there was a filling station not half a mile distant. Even more serendipitously there was a discarded plastic cyclists water bottle by the roadside. All we had to do, drenched and tired as we were, was get half a pint of fuel from the Kawasaki’s tank and pour it into the Bonnie. Removing the filler cap it became clear however that there was some fuel in the Bonneville’s tank. So I laid it over to the right and some sloshed over to the working tap, just enough to get me coughing and spluttering to the filling station. We wrung what rainwater we could out of our gloves. The black dye on Sean's brand new and very expensive summer weight gloves had sent his hands completely black and despite copious scrubbing remained like that for days. My own sopping wet Richa wax cotton jacket had failed in its task of keeping the rain out, but I'd been too damp to extricate my nylon overjacket from its hiding place. And thus, squelching slightly, we began the final ride on to the Shepherds Inn, Langwathby. We arrived 20 minutes late for dinner, dripping dirty water on the carpet and looking dishevelled. The landlord, the kind of grumpy looking chap who you only find running rural pubs, took pity upon us and rustled up one of the finest shepherds pies I’ve ever eaten. Without anywhere near enough planning, one Tuesday lunchtime we headed off. The auspices were not great. Despite our intention to only use A-roads, the only way north was across the Severn Bridge to Chepstow, and that meant the first 30 miles would be either a horrid ride through the chemical flecked wastelands of Avonmouth, or up the M5 and along the M4. Not having ridden the Bonnie along a motorway yet and having a pathological hatred of riding motorcycles along them anyway, I didn’t enjoy it. We stopped briefly at the first services to make sure all our luggage was staying put, then progressed at a steady 65-70 up the M5, onto the M4, stopped at Aust, rode over the decidedly pockmarked old Severn Bridge, with a considerable crosswind and the threat of a shower, and passed Chepstow into the Wye Valley. This experience was better. I hadn’t ridden the Chepstow to Monmouth road in an age, but it was as good as I remembered, though it did also seem to have quite a lot of cliffs falling onto it. We stopped briefly at Tintern, then headed onwards, blatted through Monmouth and kept going. Like the rebels we were we had not, at this stage, considered a first night stop off, intending to find “somewhere near Shrewsbury”. Sean’s speedometer snapped it’s needle and seemed to seize. We got to Hereford, which turned out to be a horrible place to navigate. This was especially the case as we hit it at school run time, in a city that had just the one bridge over the River Wye and is a massive bottleneck. Halfway across town my clutch started playing up and was slipping badly. We pulled over in the car park of a closed-down pub opposite a run down Pizza Hut. I have to be honest, Hereford wasn’t as pretty as I remembered it. In fact, it was so ugly I didn't take any pictures. After giving the bike half-an-hour to cool down and tweaking the cable a little, we were back rolling. We had actually broken through the worst of the traffic and the road to Leominster is a good one, though the time lost waiting for things to calm down meant we had to forego the recommended stop at the OK Diner. The road stretched northwards, and after the Bonneville's little tizzy, there were clear and delightful roads through the Welsh Marches, through Church Stretton, where I forgot to take any pictures here too, which was a shame as the area is stunning. We whizzed and clattered around the Shrewsbury bypass and on to an old school transport caff outside Whitchurch where we had to decide what to do next. Maps were studied, and websites perused, and we decided to head for Chester, for no more good reason than it possessed a cheap Travelodge. It started, as many good things do, over a pint on a winter evening. I’d had a communication about the Shetland Classic Motor Show and thought it might be a suitably stupid thing to visit. I mentioned it to my chum Sean, over a pint of Wetherspoons finest mediocre real ale, and he, owner of an early 80s Kawasaki Z650, agreed that riding motorcycles from Somerset to Shetland was a stupid idea, so we decided to go for it. At the time I wasn’t sure I even had a suitable machine to attempt it on. Back in my teens I’d managed to pilot an MZ150 from John o’Groats to Lands End along with a trio of like-minded fools, but I thought I might try something a little larger. 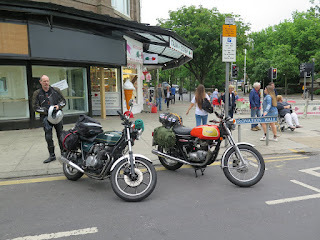 I had my BSA Starfire, but the idea of taking that on a 2,000 mile round trip wasn’t something that filled my heart with joy, and while my FT500 Honda single was a possibility, I felt it might not really be up to the job of hauling self, plus gear to the other end of the country. My XS650 was in a state of flux, as despite an expensive top end rebuild it stubbornly refused to run effectively. My Ducati was definitely not a goer in any way, needing far more money throwing at it than it warranted. Still, the plan was born, and I was sure a suitable machine would either materialise, or the Yamaha would rise from its zombie state. Perhaps I could borrow something if needs be? The Ducati was sold some months later, and I was lurking around HJ Pugh’s auction site one Saturday morning, considering picking up some superannuated old Jap four for the trip, but few attracted my attention. And then I unexpectedly bought a 1973 Triumph T140 Bonneville. Which of us can say they haven’t done that? I had placed an absurdly low bid upon it and expected someone to over bid me. Nobody did. The Bonnie arrived a few days later, and apart from a dodgy paint job, it seemed a fine bit of kit. I’m one of those people who likes to name their motorcycles and it was christened Big Vern. Why so? Big Vern, back in 1975, had a bit part as a getaway vehicle in an episode of the Sweeney (Season 3, episode 5, The Taste of Fear). 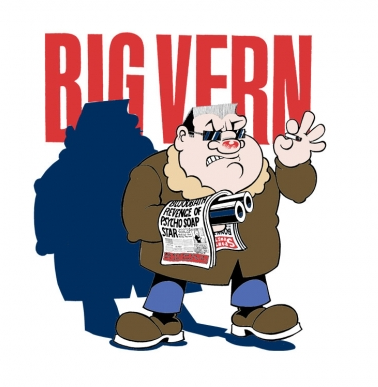 Big Vern, is also a character in the scatological adult comic Viz – a 1970s gangster who constantly rants about “needin’ a shootah” to visit the shops and always shoots himself in the last panel after a misunderstanding, because “no copper is gonna take me alive”. A mid 70s Bonneville wasn’t part of the plan to go to Shetland. I’d been planning on a cheap old jap, or a new Royal Enfield Interceptor 650. Or a Guzzi V7. None of which looked like materialising, and in any case the cookie jar was empty. So the Bonneville it was. Sean and I were, we freely admitted, not really match fit. We looked at maps. We decided that motorways were out, out of deference to Big Vern’s years. We would try to do most of the journey on A and B-roads. We were also far too old and stiff to camp or do anything silly like that. Pubs, Travelodges and B&Bs were the agenda. We worked out a route that meant we would need to cover 180 miles a day at the most, with plentiful stops. We went on 150 mile weekend proving runs. The Bonneville and the Z650 were fine – the Bonnie wasn’t rattling or banging, burning or leaking excessive amounts of oil, and the Z was whirring on nicely, if occasionally squirting out black smoke. The Bonneville was given an oil change, spare bulbs and a clutch cable were acquired, and as it wasn’t obviously broken anywhere else, I decided that I wouldn’t fix it. If it broke on the way, I’d just have to fix it or give up. The tool roll was packed with as many spanners and sockets as I could manage – probably enough to do an engine rebuild. The Kawasaki broke its speedometer drive the week before the trip, so that was replaced and Sean, concerned about the state of his front forks, slotted on a replacement set from a Z750L4. Tank bags were bought at a discount at Stafford, Sean picked up panniers and a tail pack from Ebay and I resorted to my old army surplus panniers. We were good to go. 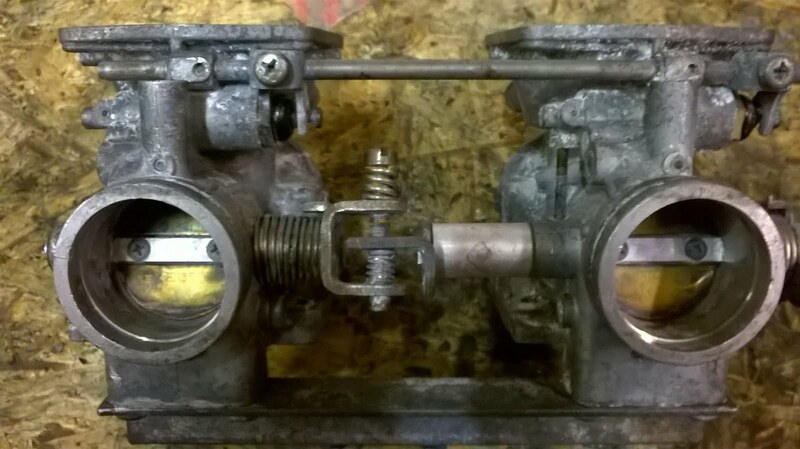 Alpha have vapour blasted and ultrasonically cleaned my carbs. aren't they pretty? Cassius has been in the shop for a while while the very nice men at Alpha work their magic upon him. And I've been buying lots and lots of parts from Germany, and Holland and the Bristol Classic Bike Show. And the Germans sent me a new set of oversize pistons and a cam chain and an oil filter. And the Dutch sent me a gearshift shaft and a starter motor gear and a new wiring loom and a very groovy thing called a "Hall Effect Ignition", which basically does away with fiddly old contact breakers, but doesn't need the big box of troublesome electronics on an electronic system. And I bought a side stand spring and turned the empty boys room into a workshop, where I've been renovating chrome things and cleaning up brake calipers. Meanwhile the chaps at Alpha have had the barrels rebored and put the engine back together, and put it back in the frame, where it gleams and makes the rest of the bike look a state. And then we hit a snag. 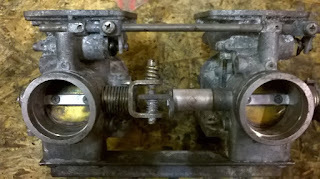 At some point, between 1979 and 1996, one of the previous owners had messed about with the Mikuni BS34 carbs, and chewed up the heads on the pilot jets - two little brass nodgers in the bowels of the fuel system. And after I had cruelly left ol' Cass to sit for eight years, those jets had got bunged up. And Simon from Alpha, genius though he is, was reluctant to take on the surgery needed to get them out - he was honest enough to admit he didn't fancy buggering up my carbs doing it. Well, obviously there isn't a working set to be had for a Euro spec XS650. What to do? Well, I could find a precision engineering shop to try and get the jets out. Or i could, apparently, buy a secondhand set for a GPZ500 Kawasaki for about 50 quid, which is allegedly a bolt on replacement, but an absolute bugger to set up. 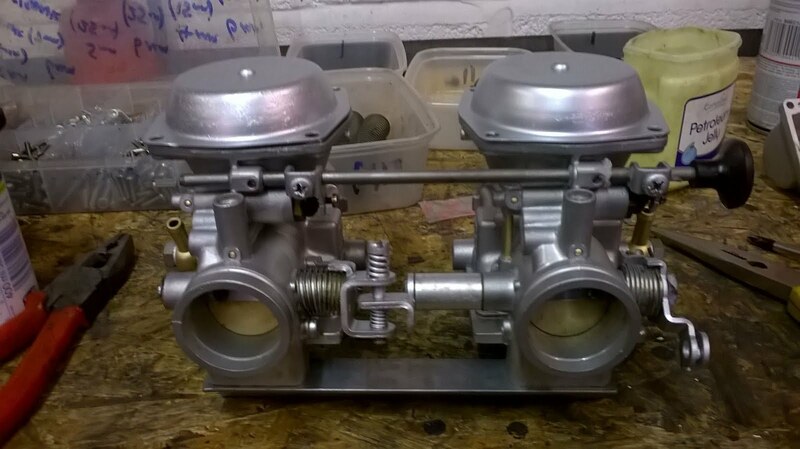 Or I could spend an eyewatering four hundred quid on a brand new Mikuni slide carb set up, which look great, but are also a sod to set up. Anyway I got the carb bodies from Alpha to measure them up for the sourcing of replacements. And then I did what I usually do when confronted by a knotty problem. I looked at them for ages. And I went through my screwdrivers and could not find one that fitted the pilot hole. So, I filled the holes with wd40 degreaser and nipped down my local hardware shop, where I paid £3.11 for a set of six long jewellers type screwdrivers. And I got them home and worked on the jets with the biggest screwdriver of them for a bit, just in case they would budge, but they wouldn't. So I had another think, and remembered that ages ago I bought one of those cheap modelling power tools from Lidl. So I went through all the hundreds of grinders and polishing wheels and drill bits in the set and found a tiny little reamer. Now the modelling tool itself only runs clockwise, and reasoning that applying clockwise pressure on a screw that is already jammed in clockwise was a bad idea, I clamped the reamer in the old Black and Decker drill/driver and gently at reverse, made the business end pilot hole a little bit bigger. It's those tiny details that are so important. Four tank badge oval set screws, £2.95. Inc postage.